Abrasive blasting is the operation of forcibly propelling a stream of abrasive material against a surface under high pressure to smooth a rough surface, roughen a smooth surface, shape a surface, or remove surface contaminants. In finishing, abrasive blasting is commonly used to prepare a surface for a powder coating application. The abrasive blasting process leaves an “anchor pattern” on the substrate that allows the paint to adhere and create a strong bond with the surface. Abrasive blasting can take place in a blast room, a blast cabinet or in an open area such a shipyard. Blast rooms and cabinets have dust collectors to capture and clean the dust-laden air and remove the dust particulate before returning the air to the workspace. There are several types of abrasive media; some are highly abrasive, whereas others are milder. The most abrasive are steel shot or grit, then garnet media. Moderately abrasive variants include glass bead blasting, plastic media, walnut shells and corncobs. 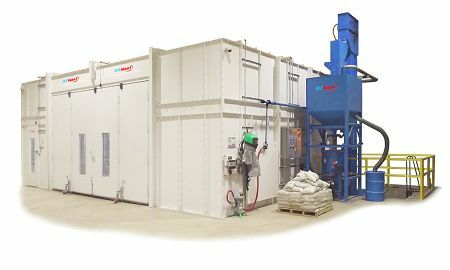 Blast rooms and blast cabinets have blast pots connected that provide the blasting media at an elevated pressure, delivered through blast hose and a blast nozzle. The blast nozzle size is selected for a specific production rate of the blast media and can vary in size from 3/16” to ½” in its orifice size, with respective blast media and compressed air volumes increasing with the size of the orifice. A small blast nozzle (3/16”) consumes 40-80 cubic feet of compressed air per minute and a larger (1/2”) consumes 340-540 cubic feet of compressed air per hour. The higher the production rate needed, the higher the consumption of compressed air and abrasive media. Finishing Consultants can provide blast cabinets or blast rooms, completely outfitted with dust collectors and the necessary blast pots, blast hoses and nozzles, and operator protection equipment including blast helmets, breathing air systems, and protective clothing. We can also supply blast media materials from glass beads, aluminum oxide, silicon carbide, garnet, steel shot and steel grit, as well as walnut shell and corn cobb products. Shot peening systems, a variant of shot blasting, are available for treating various metal surfaces to prevent fatigue failure. 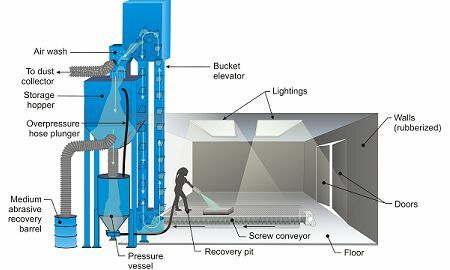 Blast rooms can be provided with an Abrasive Recovery System to be able to reuse the abrasive blast materials repeatedly. Steel shot and grit can be recovered and reused hundreds of times lowering cost of abrasive purchases and optimizing production. Abrasive recovery systems can be mechanical; auger with bucket elevator style, or pneumatic with capture pans metering spent abrasive into a delivery hose back to the clarifier and blast post for reuse. Contact Finishing Consultants and speak with an Abrasive Blast expert to review your requirements.